Chance Hawkins, a 10th grader at Fort Worth's Dunbar High School, is getting help this semester from an aide. Edgar Ortiz helps him take notes and adjusts him in his wheelchair when Chance gets tired. For a kid with severe physical disabilities, having an aide at school can make a huge difference. It can affect whether a student stays in school or drops out, whether the student passes or fails. As part of KERA’s American Graduate initiative, Stella Chavez catches up with Class of ’17 student Chance Hawkins, a sophomore at Fort Worth’s Dunbar High School. Chance wasn’t sure about having an aide assigned to him from the time school starts to the end of the day. Some also wondered if aide Edgar Ortiz is doing the school work for him. Ortiz helps Chance with everything from taking notes to adjustments in his wheel chair. Chance has Duchenne muscular dystrophy, which causes muscle weakness and deterioration. He tires easily. Ortiz also breaks down complicated subjects. It’s a job that requires a lot patience, something he learned with his younger brother, who lives with him now. Ortiz soon realized that disabilities don’t have to keep someone from a fulfilling life. The experience inspired him to study early childhood education at Texas Women’s University. He wanted to become a bilingual teacher, but someone told him schools need male special education teachers. So, he got certified in that. Edgar Ortiz was inspired by his younger brother to work with students who have disabilities. Here, Ortiz goes over material Chance is learning in his World History class. Ortiz had been working with disabled kids at a middle school when the district called him. Chance needed one-on-one help through the end of the semester. On a recent morning, Ortiz tries explaining the frequent changes in government after War World I. He says Chance can recall information, but sometimes, complicated material takes time to grasp. Motivation can be a challenge. 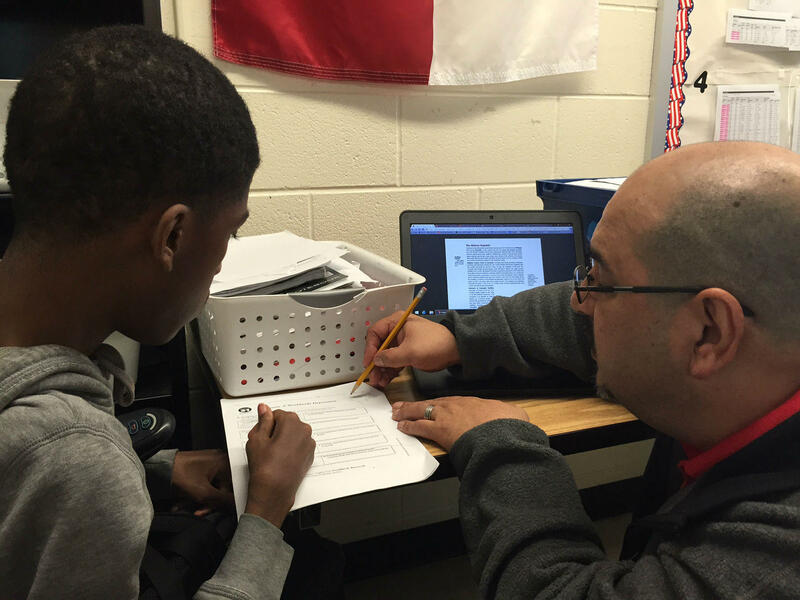 At Dunbar, the teachers try to be flexible – they let Ortiz tweak the lessons. The strategy seems to be working. Chance got As and Bs on his latest report card – a first, he said. History teacher Michael Epley has noticed a difference, too. Donna Hunter, Chance’s 10th grade English teacher, said having Ortiz in the classroom has been helpful for other reasons, too. 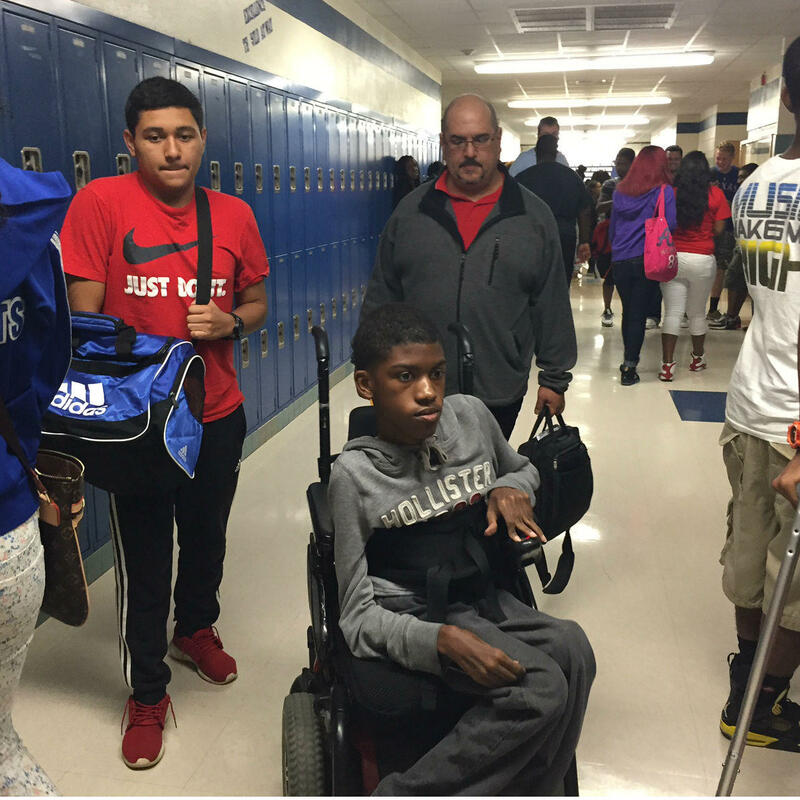 Chance Hawkins navigates the hallways of Dunbar High School in his motorized wheelchair. His aide, Edgar Ortiz, follows behind him. The other day, when Ortiz stepped away, a boy stood up and walked toward Chance. In helping Chance, aide Edgar Ortiz is teaching a lot of other lessons, too. Classes at most North Texas schools begin in a few weeks. When Phantasia Chavers starts 10th grade at Cedar Hill High School, she hopes to be spending time after school on the JV volleyball team. Phantasia’s one of the Class of ’17 students KERA’s been following as part of the American Graduate initiative. For Phantasia, a new school year means a new school and a second chance on the court. The first day of school is a week and a half away, and 20 new students who just arrived from China are already settling in at International Leadership of Texas. Each kid will be assigned a student mentor at the Garland charter school. One of those mentors is a member of KERA’s Class of ’17 project. There’s an innovative school in the Fort Worth school district with about 500 students. Not one of them has been in the U.S. more than a year or two. It’s called the International Newcomer Academy. It’s the focus of the latest installment in Generation One, a KERA American Graduate series.